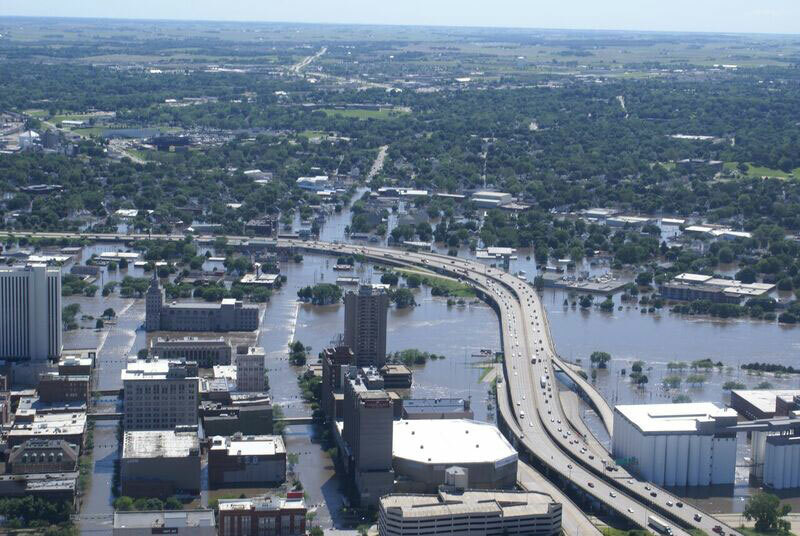 Aerial view of the 2008 flooding. 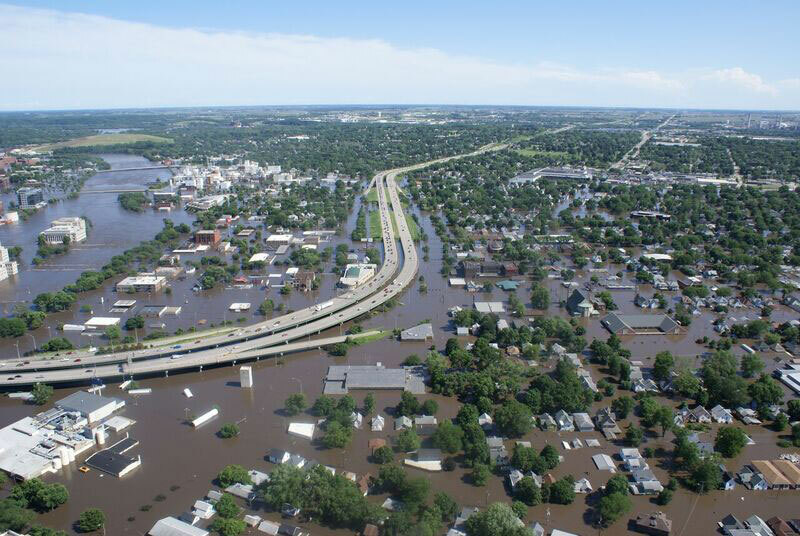 Residents of Cedar Rapids are marking the 10th anniversary of record flooding when the Cedar River swallowed up huge portions of the city. “It also has some images of the houses and families, the actual neighborhood that was there before the 2008 flood,” Fowler says. Fowler says that neighborhood is a good example of how the city responded following the flooding. “So many of the families were taken out of harms way with the purchase houses in the area that was flooded and so hard hit,” Fowler says. “There’s green space where generations of families had grown up in that area. That is an area that is seeing new housing in areas that are redeveloping as neighborhoods.” Other neighborhoods have also changed in the 10 years. “Our Kingston Village neighborhood is just bustling with downtown housing now and new commercial areas. And then what people are most familiar with in the last 10 years is the development of the NewBo neighborhood along with Czech Village,” according to Fowler, “really coming back from the flood in a different way than it had been before as a real cultural center, a neighborhood commercial hub — a vibrant area that people go to.” The downtown area of Cedar Rapids has also undergone many changes since the flood waters inundated and surrounded the buildings there in 2008. 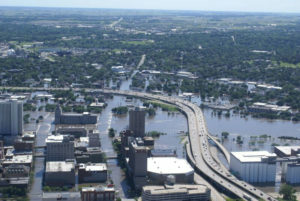 The 2008 flooding inundated several Cedar Rapids neighborhoods with water. “We surpassed most commercial comebacks from natural disasters like this,” Fowler says, “but it was still incredibly devastating. What we’re seeing downtown is incredible regrowth. The city of Cedar Rapids actually ended up purchasing the hotel, the convention center was rebuilt, the arena was redone,” she says. Fowler says talks started about rebuilding soon after the flood waters went down. She says they had to deal with the devastation, but think to the future. “We never want to diminish how much loss there was. Really families lost everything in a lot of cases,” Fowler explains. “And you never want to diminish that and you want to make sure as you build back — and we did this through a lot of different planning efforts and development efforts — you are going to build better than it was before. 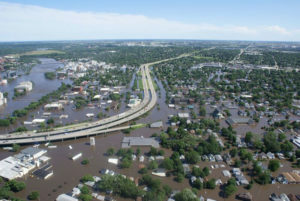 You are not just going to put things back they way they were.” She says the efforts to rebuild and include more flood protection and new ideas has helped them overcome the loss from 2008. “A lot of momentum has happened as a result of that and you see a lot of pride in the community. And those folks who were so devastated by the flood have absolutely been a part of that in rebuilding the community. And I think have a lot of pride in the city as well,” Fowler says. The plaza features a memorial plaque with the story of the neighborhood. The center of the plaza has a blue light that will shine at night and is symbolic of the blue porch lights that were used to indicate that a home was occupied when the 2008 flood waters receded. The plaza also features a distinctive gateway that will welcome residents or visitors to the site, and a privately-funded sculpture West Side Rising that symbolizes the recovery of the neighborhood and the residents and business leaders. The commemorative ceremony at Northwest Gateway & Memorial Plaza is today at 2:00 p.m.